Texans overwhelmingly passed a constitutional amendment Tuesday to jump-start financing for water projects in the state: Proposition 6. The plan will take $2 billion in surplus state money (from the Rainy Day Fund) to start a low-interest loan program for water projects in Texas. The measure had widespread support from both sides of the aisle as well as business and environmental groups. It passed with over 73 percent of the vote. “It really underscored how precarious our future is when it comes to water, and how crucial it is that we shift towards a more moderate, water-efficient future,” says Luke Metzger, Director of Environment Texas, who supported the measure. Roughly a third of the funding in the programs are set to go towards conservation projects, an aspect of the plan that helped win support from many environmental groups. 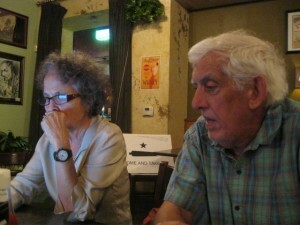 Linda Curtis of Independent Texans and Jere Locke of the Texas Drought Project watch the election returns roll in Tuesday evening. Both groups opposed the measure.